Hurricane Sandy photos, undecided voters, and the art that enraged big coal: The week’s most interesting Slate stories. 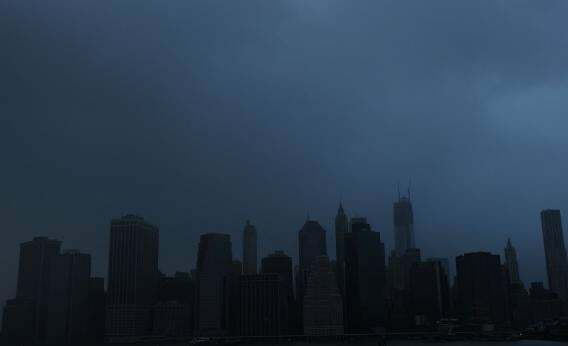 Much of Manhattan lost power during Hurricane Sandy. Hurricane Sandy pounded the East Coast on Monday and many are still without power. In Slate, John Dickerson analyzes how Sandy could play on the campaign trail. L.V. Anderson explores what might happen if people are still without power on Election Day. William Saletan slams Chris Christie for calling people selfish when they ignore evacuation orders but not when they skip health insurance. You can also view photo collections from before the storm, the beginning of the storm, the height of the storm, and the aftermath. Additionally, at Behold, David Rosenberg showcases stunning photos of other storms from Mike Hollinghead, and Kate Phillips shares more iconic weather photos. “Dear Twitter, Don’t Believe Everything You Hear on a Police Scanner,” by Will Oremus. The New York Stock Exchange is flooding! The subways will be closed all week! A hospital is burning! Actually, no. Oremus traces Twitter’s most outrageous rumor back to its surprising source: a police scanner. And he explores how Twitter is complicating good local reporting. “The Case for Price Gouging: Trying to prevent merchants from hiking prices during disasters is futile and counterproductive,” by Matthew Yglesias. Liberals, conservatives, and panicked shoppers agree that it’s wrong to raise prices during emergency conditions. But they’re all “hideously misguided,” Yglesias says. He argues that laws against price gouging can do far more harm than good. “The Case of the Mormon Historian: What happened when Michael Quinn challenged the history of the church he loved,” by David Haglund. Haglund shares the story of Mormon historian Michael Quinn and what happened when Quinn “decided that his interest in the ‘problem areas’ of the religion’s past jeopardized … his membership in the church itself. Haglund also provides an important primer on the structure of the church and figures who wield outsized power. “The Undecided Voter Revealed: We asked America’s undecided voters to explain themselves. They gave us an earful,” by John DickersonJohn Dickerson asked readers to let him know if undecided voters really do exist. Apparently, they do. And their explanations about why they haven’t yet made up their minds surprised political scientists. The campaign heads into its final weekend with the race in a dead heat. Matt Yglesias explains the likely shifts in economic policy under a President Romney, including a messy health care fight with Congress and a potential trade war with China. In the spirit of bipartisanship, Yglesias also has the details on an Obama second term, during which Democrats might be able to bargain their way toward real tax reform thanks to the looming threat of the fiscal cliff. Meanwhile, John Dickerson provides some closing thoughts on Romney’s run, arguing that the Republican’s moderateness has been the key to his strength through the race. And if you need a spot of comic relief, don’t miss Taige Jenson and Andy Bouve’s Political Kombat: Battle Royale, in which the two presidential candidates face one final fight. The fiscal cliff has never been so perilous. “Halloween Needs More Death: Horror is the counterintuitive path to happiness,” by Oliver Burkeman. When was the last time you thought about death? Hopefully recently! “Terror management” theorists argue that the more you contemplate your eventual demise, the happier you’ll be. Oliver Burkeman makes a provocative case for a more morbid Halloween. “Not Right in the Head: Listen up, cyclists: Riding with headphones is incredibly dumb,” by Josh Levin. Listening to music while biking is dangerous, so why does anyone do it? Josh Levin issues a condemnation, saying that music not only distracts cyclists but prevents them from hearing important cues on the road. “Can Fido Find the Drugs? Readers respond with their own stories of drug-sniffing dogs,” by Emily Bazelon. In anticipation of this week’s Supreme Court cases on drug-sniffing dogs, Emily Bazelon asked readers about their experiences. She found the dogs weren’t as good at their jobs as law enforcement officials might hope—sometimes missing the drug scent but always able to sniff out the cake and cookies. “The Artwork That Infuriated Big Coal: Academic and artistic freedom, Wyoming-style,” by Michelle Nijhuis. When the president of the Wyoming Mining Association threatened the University of Wyoming’s funding, some public art that was critical of coal mysteriously disappeared. Michelle Nijhuis examines art censorship at public universities.